Trend 1 – Showers that are made to last – Ditch the old soaking/Jacuzzi tub – nothing screams 80’s styling as much as the big monster tubs that are barely used. 2013 is about the larger shower (that takes the place of the old tub + smaller stand up shower that used to be in the bathroom). When designing consider making it an accessible shower by using a barrier free entry and slip resistant tiles. 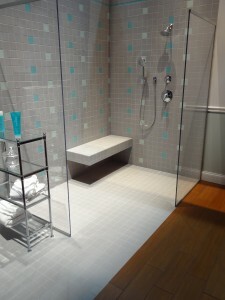 To add more function, safety and comfort add a hand held shower, rain shower and corner bench seat. Trend 2 – Low maintenance bath countertops using Quartz – While granite is still being used a lot low maintenance quartz composites are growing very fast. They require minimal effort to keep up (which is excellent for a wet space) and look great. Trend 4 – Staying put – Baby boomers want to stay in their homes in longer. This has changed bathroom design greatly. There are now Certified Aging in Place Specialist (CAPS) who can guide owners on how to make a cool bathroom space that will also serve them over the long run (safe bathrooms do not have to look like hospital rooms any more with products like full body driers, decorative grab bars and well designed roll under sinks. Universal design (baths designed to be used by anyone) will become a buzzword known by many. Trend 5 – Healthy Homes & Healthy Living – Sustainability is not just a cool word anymore – homeowners are looking for the use of low VOC materials to improve air quality and to create an environment free of toxins and harsh chemicals (more care will be taken to ensure that projects are done responsibly with long lasting safe materials). What do you think about these 5 bathroom design trends and ideas? Please comment below. Contact Cleveland Design & Remodeling (216-658-1270) or the Bath Doctor in Columbus (614-252-7294) for design ideas and estimates on bathroom remodeling. Cleveland Design & Remodeling has Certified Aging in Place Specialists to assist with a project.